NAIROBI- Kyadondo East MP Robert Kyagulanyi Ssentamu, aka Bobi Wine, has said President Museveni is worse than dictator Idi Amin Dada, who ruled Uganda from 1971 to 1979 until he was overthrown by the Obote II regime in the latest Uganda news. Appearing on Kenya’s Citizen Television on Wednesday night, Bobi Wine also accused Mr. Museveni of failing institutions in the country by surrounding himself with his relatives and tribesmen, who only praise and not criticize him. “It has been said before that power corrupts, absolutely, I believe he is drunk with power. 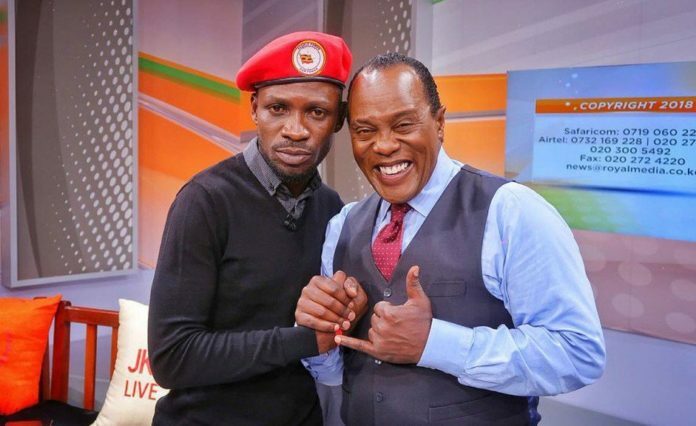 He has been convinced by those who surround him that he is a god of sorts,” said Bobi Wine during the live interview hosted by Jeff Koinange. The legislator is still nursing injuries sustained at the hands of security forces who tortured him and several others following the chaos ahead of the Arua Municipality by-election on August 13. 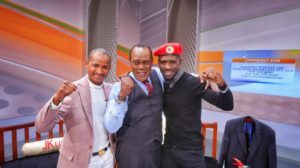 Embakasi East MP Babu Owino was with him during the live interview. Bobi Wine also rallied the Kenyans to support freedom of speech in the region. “…power is for the people, not only Ugandans but for all East Africa. We belong to East Africa, not as a club for the presidents but for all of us; united not only politically but by the values we share,” he added. Bobi Wine on Wednesday arrived in Kenya ahead of celebrations to mark Moi Day. He is in Nairobi at the invitation of Kenya Young Parliamentarians Association. Kenya Young Parliamentarians Association invited Bobi Wine “out of profound respect for the role he is playing in inspiring young people across the continent”. Moi Day is in honor of former Kenyan President Daniel Moi. This year, the Government of Kenya has chosen to follow last year’s court orders to recognize the day and gazette it as a public holiday. Bobi Wine has gained worldwide popularity since his arrest in the Arua election and subsequent torture by security operatives. Following his detention, several groups in Kenya took to the streets of Nairobi in August to protest against his detention by the Ugandan government. The Law Society of Kenya, Amnesty International, Ugandans living in Kenya and student leaders gathered at the Freedom Corner in Nairobi and marched to the Ugandan embassy on Riverside Drive. “President Museveni’s time is up. He is the last of Africa’s dictators and he must go. Bobi Wine is innocent, they are using him as a scapegoat. He is not just a person but an idea. He represents the 75 percent of youth who make up the population of Africa,” activist Boniface Mwangi said during the protest. Members of the LSK donned suits and red ribbons as a sign of solidarity with Uganda.